Of all the blues tops I've made and am still making, this one is the most unique. 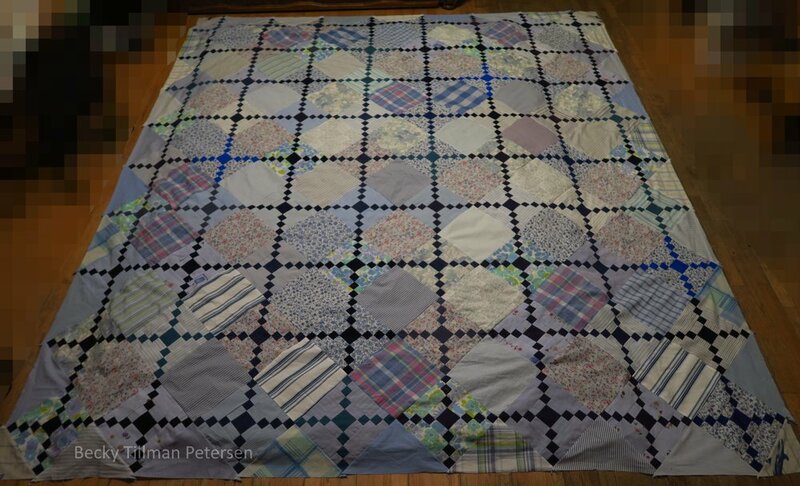 I'm taking odds and ends of all the 14+ tops I've made and trying to make a cohesive quilt top out of them all. Let me show you where this project is to date. I'm creating it in rounds. 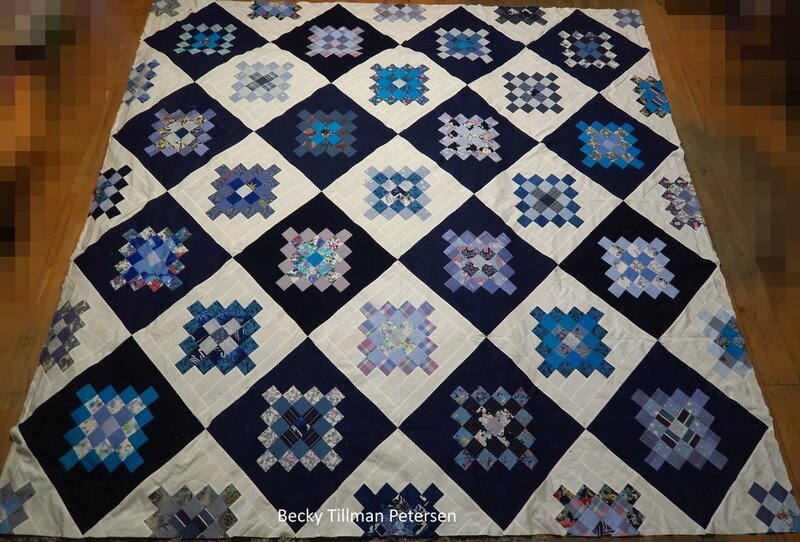 I'm taking it as a challenge to try to make it somehow look like a cohesive unit--and am attempting to do that with the repetition of the light blue sashing. At this point it's not all that big. I'm getting ready to add a few more rounds. Let me show you the next step in this process. 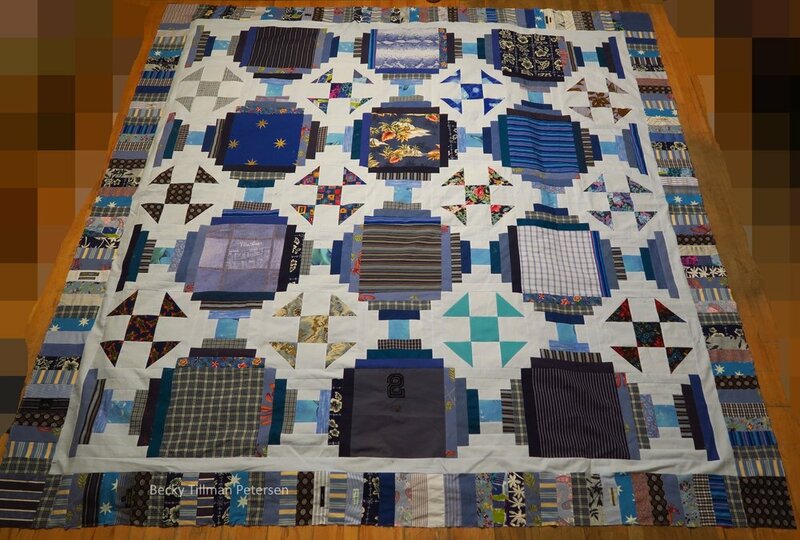 After I met my charity quilt goal (for the day), I worked on this one quite a bit. I am definitely going to be able to use up all the larger "bonus triangles" that I had. Right now it is 56"x56". 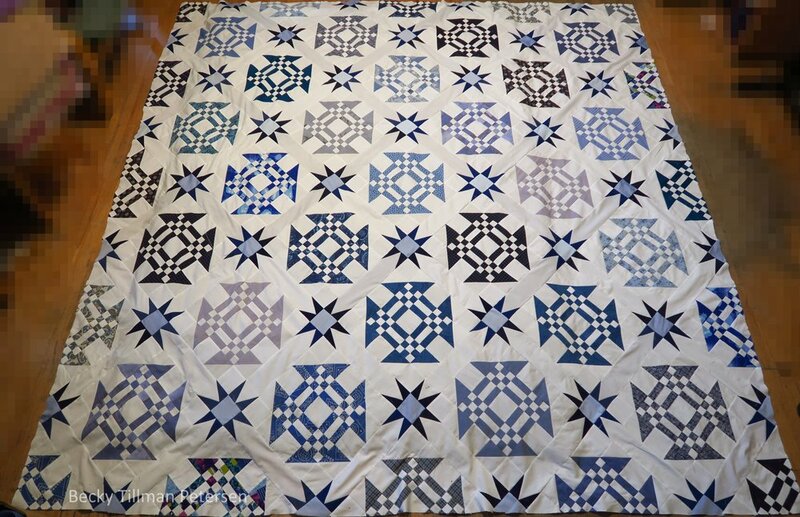 Next I'm planning on adding another round of navy blue - and then the rest of my bonus triangles only facing "out". At that point it will be 62"x62". After that I'll do some 12" blocks - and I'm looking forward to those. I hope to put embroidered pieces (cut from various shirts - nothing I embroidered) in those and some wonky blocks. 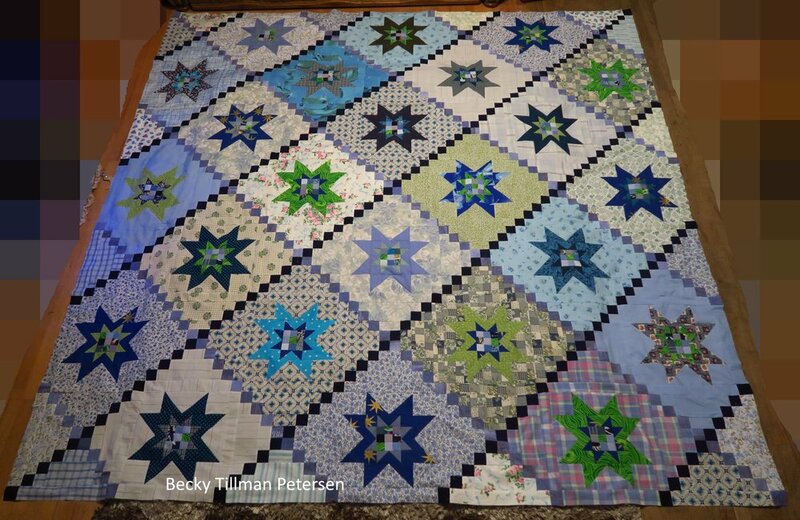 This is where I may make up some more blocks from my small bonus triangles and use them there - am thinking - maybe some tiny pinwheels? I also want to use a few pockets in that 12" round. It's all just swirling around in my head - as I'm working on this round. At least at the very moment, I know what I'm doing! 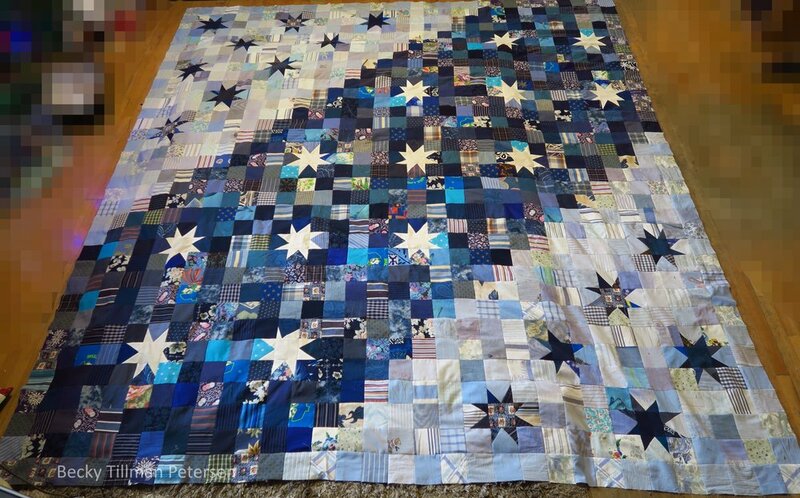 In case you are new to this blog - I'm using up leftover pieces from these - I decided to go ahead and put pictures of all the tops in this series so far - so you can see at a glance this whole thing. You may click on them to see them larger if you wish. 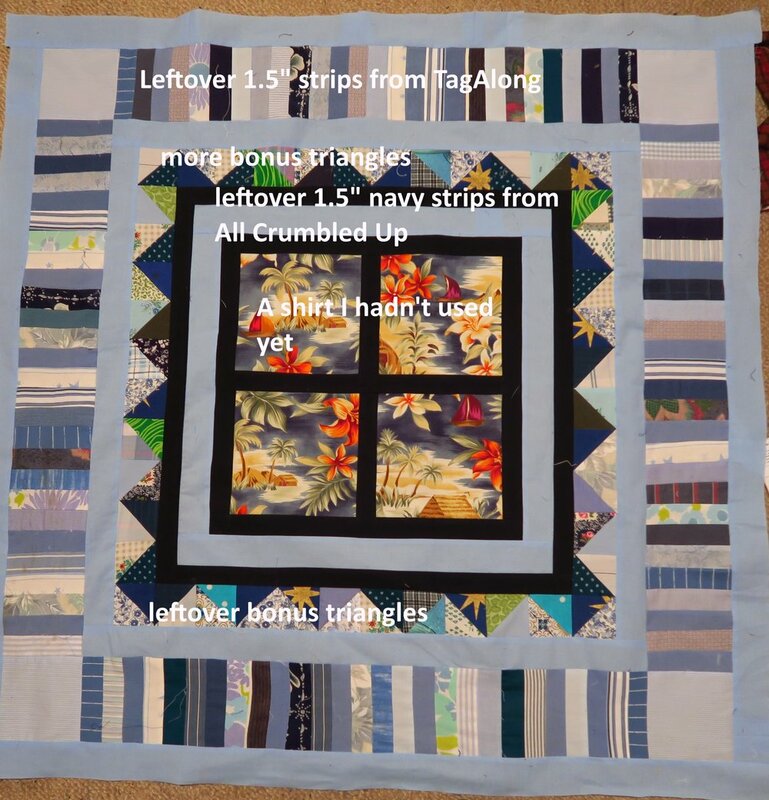 Top #15 is at my sewing machine and I'm working on it daily when I'm not quilting. It's bit tedious, however, and so I'm forcing myself to work on it. I'm sure when I get closer to getting finished, I'll work even harder on it. In the meantime, it's there, but not really exciting. So it's like this - Tops # 1-14 - you've seen, Top #15 is on the sewing machine. Top #16 is my next crumbs blocks from the blues and so that makes this one Top #17. It's amazing how fast it adds up. And there you go...I've decided to reveal this one as I go along - just to maybe share with you some of my thought process in making this particular top.